What better way to add luster to your mining shares than to unearth the world's second biggest diamond? Shares in Lucara (LUCRF) soared 32% after it unveiled a stone of 1,111 carats -- which it says is the biggest gem quality diamond found in more than 100 years. The stock market move added about $150 million to the value of the company. "The significance of the recovery of a gem quality stone larger than 1,000 carats, the largest for more than a century and the continued recovery of high quality stones...cannot be overstated," said CEO William Lamb in a statement. The stone was only found on Monday, and the company hasn't yet decided when or how to sell the stone into the market. And it's impossible to price at this stage, Lamb said on a conference call with investors. "It's early days. We need to see how best to get the maximum value of the stone," he said, adding that he's already been inundated with emails from potential buyers. The stone is too big for Lucara's own scanner so will probably go to the world's diamond polishing market in Antwerp, Belgium, to be assessed first. 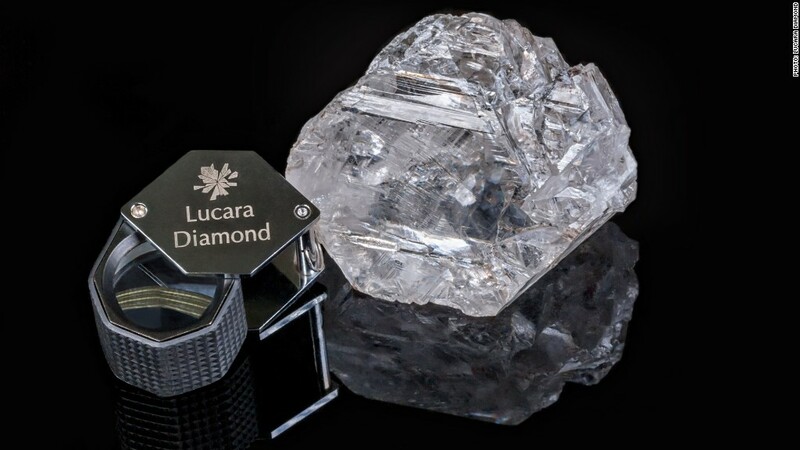 Lucara also uncovered two "exceptional" white diamonds, estimated at 813 carats and 374 carats, at the same mine. "It would not be the best strategy to put all three on the market right away," the CEO said. The discoveries have transformed the Canadian company's fortunes. Its shares, which are listed in both Stockholm and Toronto, had lost 26% this year prior to the unprecedented finds. Friday's runaway gains wiped out almost all those losses. 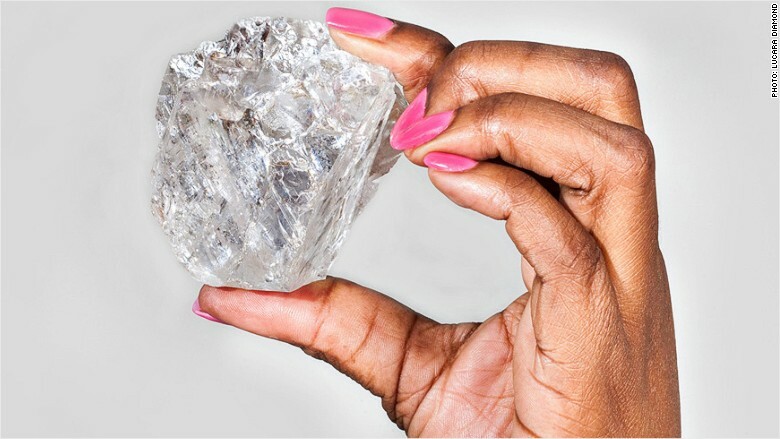 Lucara says the diamond was found in its Karowe mine in the southern African nation of Botswana, which has been up and running since 2012. The biggest of the three diamonds was found using the latest in recovery technology. With older equipment, Lamb said, it might have been missed and been ground up with waste stones. The largest gem quality diamond was the 3,106 carat "Cullinan Diamond" found in South Africa in 1905. From that was cut the "First Star of Africa" which now adorns the Royal Scepter -- one of the British crown jewels now on display at the Tower of London.